James Cohan Gallery is pleased to announce an exhibition of new work by New York-based sculptor Roxy Paine. 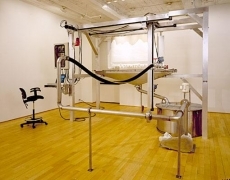 The exhibition will feature two of Paine's newest art-making machines, PMU (Painting Manufacture Unit), 1999-2000 and Drawing Machine, 2001. 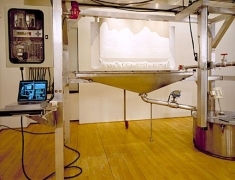 Both machines are intricately engineered and fully automated to produce unique works of art shaped by random effects caused by such factors as gravity and drying time. PMU consists of a large metal scaffold supporting a paint-spraying nozzle aimed at a horizontal canvas. 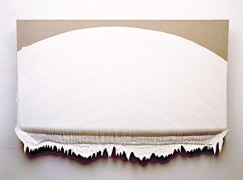 Entirely programmed and controlled by a laptop computer, the machine responds on command by spraying a jet of thin, white paint across the surface of the canvas as it is mechanically raised and lowered. To manufacture one painting, this cycle may be repeated up to 200 times. 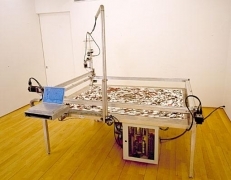 The newest of the machines, Drawing Machine, 2001, is similarly engineered, in that the movement of the flat bed machine over paper and the dispensing of inks are navigated and controlled by a laptop programmed according to Paine's instructions. With these system-based machines, Paine continues his exploration of the hand-made vs. the mass produced, control vs. chance, nature vs. artifice. Roxy Paine was born in New York in 1966. Widely recognized for his art making machines as well as his naturalistic sculptures and reliefs of plants and fungus, Paine's work has recently been included in exhibitions at the Victoria and Albert Museum in London, the 5th Lyon Biennale of Contemporary Art in France, the ICA in Boston and P.S.1 in Long Island City, Queens. In 1998 Paine had a solo exhibition at the Musée d'Art Américain in Giverny, France. exhibitionsly on view through July 8, 2001, as part of 010101: Art in Technological Times at SFMOMA is SCUMAK no. 2, Paine's second "Auto Sculpture Maker". Roxy Paine lives and works in Brooklyn, NY.